(Walter Schnackenberg, Munich), by April 1925. (F. Kleinberger, Paris and New York), by 1927. Private collection, New York. (Count Alessandro Contini-Bonacossi, Florence), by 1929; sold 26 June 1935 to the Samuel H. Kress Foundation, New York; gift 1939 to NGA. According to a hand-written notes by Bernard Berenson on the back of a photograph of the painting in the I Tatti archive in Florence (copy in NGA curatorial files). Kleinberger lent the painting to a 1927 exhibition at The Lotos Club. Raimond Van Marle, The Development of the Italian Schools of Painting, The Hague, 1931: 13:180, fig. 119, relates that he saw the painting "in a private collection in New York," but does not specify when. An opinion written by Roberto Longhi and dated October 1929 was addressed to Contini-Bonacossi (copy and translation in NGA curatorial files). The bill of sale was for seven paintings and a number of decorative art objects; NGA 1939.1.179 was identified as "Florentine about 1475" (copy in NGA curatorial files). Loan Exhibition of Primitives, Lotus Club, New York, 1927, no. 13, as by Utili. Preliminary Catalogue of Paintings and Sculpture. National Gallery of Art, Washington, 1941: 202, no. 290, as by Giovanni Battista Utili. Book of Illustrations. National Gallery of Art, Washington, 1942: 245, repro. 202, as by Giovanni Battista Utili. Paintings and Sculpture from the Samuel H. Kress Collection. National Gallery of Art, Washington, 1959: 79, repro., as by Giovanni Battista Utili. Shapley, Fern Rusk. 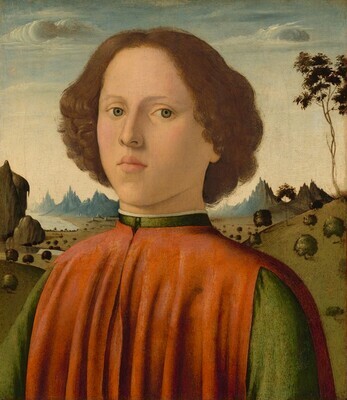 Paintings from the Samuel H. Kress Collection: Italian Schools, XIII-XV Century. London, 1966: 132, fig. 362. Shapley, Fern Rusk. Catalogue of the Italian Paintings. 2 vols. National Gallery of Art, Washington, 1979: I:73, II:pl. 47. European Paintings: An Illustrated Catalogue. National Gallery of Art, Washington, 1985: 48, repro. Boskovits, Miklós, and David Alan Brown, et al. Italian Paintings of the Fifteenth Century. The Systematic Catalogue of the National Gallery of Art. Washington, D.C., 2003: 130-133, color repro.